Military Camps were at first tents for the many soldiers who arrived with British settlements to guard convicts. Gradually barracks were built, in Hobart (Anglesea Barracks, from 1814), Launceston (at changing sites, notably Paterson Barracks) and other towns. Ruins can be seen at Oatlands, Richmond and Ross. After the convict system ended, army strength declined, and when the British Army left in 1870, the militia which replaced it lived in their own homes, though Queen's, Kangaroo Bluff and Alexandra Batteries (1885) contained quarters for soldiers. Training activities took place at camps, and a camp site at Mona Vale, Ross, was established in 1908 by its owners, the Cameron family. The new Australian army resumed use of Anglesea Barracks in 1901, and troops for the South African War trained there until over-enthusiastic spectators inspired a move to a camp at New Town. When thousands of troops enlisted in the First World War, a camp was immediately established at Brighton, but lack of water was a problem, and after the first continent left in October 1914 the main training camp was set up at Claremont, on the railway and near, but not too near, the city and embarkation port of Hobart. Trenches and dugouts provided realistic training conditions, and the camp housed up to 2200 men. Mona Vale, like Claremont on the railway line, was also used. During the Second World War, the main training camp was set up at Brighton, where by 1941 huts housed up to 2400 trainees. An artillery range was established at Mona Vale, which became the centre for reserve troops defending Tasmania. 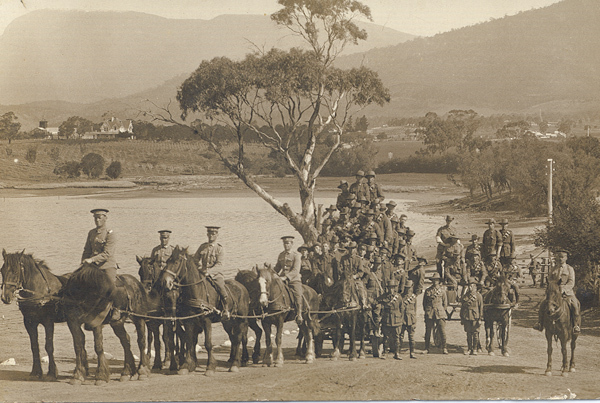 Smaller army activities dotted the state, for example at Launceston, Conara, Campbell Town, Glenorchy (Dowsings Point), South Arm (Fort Direction) and Kingston. As the need for training declined, Brighton Camp was used for army bivouacs, and to house prisoners of war (1944–46), migrants from Europe (late 1940s) and national servicemen (1950s). It was then used intermittently for camps for Army cadets and reserves, in 1967 to house victims of the bushfires, and in 1999 Kosovar refugees. The camp was decommissioned in 1995. Further reading: K von Stieglitz, A short history of Ross, Launceston, 1949; A Alexander, Glenorchy 1804–1964, Glenorchy, 1986, and Brighton and Surrounds, Brighton, 2006.